Century Fitness has been making quality martial arts equipment for decades. One of their top-rated products, the BOB punching bag – also known as the Body Opponent Bag, offers a fun and innovative approach to striking practice by emulating a live opponent, while still providing the benefits of regular equipment. We decided to take a look at it and see what it has to offer. The BOB punching bag has a jaw, throat, solar plexus, ribs, and is an excellent way to practice different angles and precision. You can execute liver shots, uppercuts, solar plexus punches, and just about any move you can imagine – especially strikes to vital areas you couldn’t really practice otherwise (unless your sparring partner is insane). 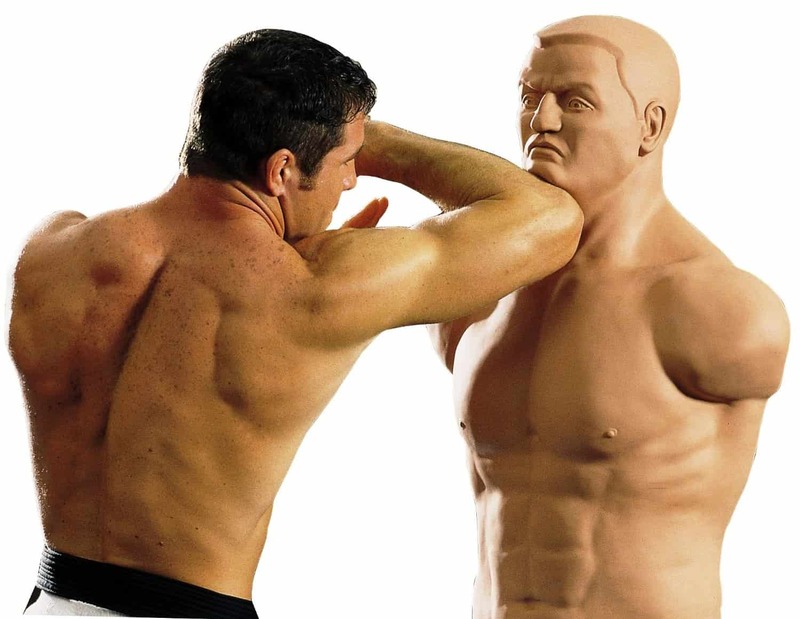 Because of the adjustable height, this punching dummy is also great for practicing techniques specific for bigger/smaller opponents. MMA fighters or wrestlers can remove the dummy from the base and use it for grappling practice as well. As for the materials, to us the Body Opponent Bag felt as close to an actual human as a punching bag can get. The head is flexible and can be punched bare-handed. The torso has a tougher surface, so I would suggest that you wear standard punching bag gloves when practicing body shots. It can take a punch without toppling over, so don’t worry about hitting too hard. Compared to other heavy bags, Bob fares well. He realistically emulates a live opponent and provides distinct body areas for you to target, unlike regular heavy bags. In this department, he’s better than any free-standing punching bag out there, and can be placed and moved anywhere, unlike a hanging heavy bag. Unfortunately, Bob doesn’t manage to provide the same level of resistance of a hanging heavy bag. Even though he weighs around 270lbs, a 100lb hanging bag will rebound less from direct hits. I advise you to fill the base with sand instead of water if you want to practice powerful kicks, as this will make the dummy heavier, and it will rebound less. Bob is around 270lbs heavy when filled, and around 50lbs when shipped. You can fill the base with either sand or water. There are 7 height adjustments, ranging from 60″ to 78″. Other than having to place the mannequin on the base, the dummy is shipped fully assembled. The base is the same one used for the Wavemaster punching bag, and if you already own it, they can be switched around and replaced. The Body Opponent Bag comes in two sizes: regular, and BOB XL. The XL model is more “complete”, being a few inches taller, and having an extended torso and thighs for kicking or knee strikes. Additionally, the XL model is more comfortable for body kicks, as it doesn’t end abruptly at the hips like the regular model. There’s no significant difference between the two in terms of quality or material. Fill the base with sand instead of water. This will make the dummy heavier, more stable, and prevent it from moving around when hit. I suggest that you buy fine sand, let it dry off, and then fill the base with the help of a small shovel or a funnel. Place a thick dense foam pad under the punching dummy. Placing a thick foam pad, or a rubber mat under the punching dummy will prevent it from moving around too much, or making noise when it rebounds. This is especially useful if you live in an apartment complex with irritable neighbors, because the sound of Bob hitting the floor repeatedly can be annoying at times. 270lbs is no joke to move around, and we found this out the hard way. Simply laying Bob on his side and using the base to roll him around is much more efficient, and will allow you to move him around constantly if you need to. The BOB training bag is great for boxing, MMA, karate, muay thai, and pretty much any striking martial art. If you are looking for a realistic, fun workout, and a nice way to improve precision and specific attacks, this is a great tool to achieve that. It can be stored anywhere and moved freely unlike a hanging heavy bag, and offers a better workout than most free-standing bags.